Each employer needs to have a written emergency plan for evacuation of employees which describes the routes to use and procedures to be followed by employees. This written plan must be available for employee review. It is best to give employees their own copy. If needed, special procedures should be developed for helping physically impaired employees. A preferred procedure for alerting employees to a fire emergency must be part of the plan and an employee alarm system must be available throughout the workplace complex. The alert system may be voice communication or sound signals such as whistles or horns. Employees must know what this evacuation signal sounds like. Training regarding what is to be done in an emergency is required for all employees. Employers must review the plan with new employees. 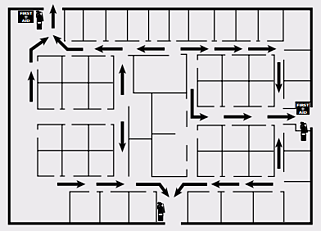 Employers must have a written fire prevention plan that complements their evacuation plan to minimize the frequency of evacuation. Stopping unwanted fires from occurring is the best way to handle them. This plan should be available for employee review. Housekeeping procedures for storage and cleanup of flammable materials must be included in the plan. For example, procedures addressing recycling, handling and packaging of flammable waste. Procedures for controlling workplace ignition sources, such as smoothing, welding and burning must be addressed in the plan. Heat producing equipment, such as burners, heat exchangers, boilers, ovens, stoves, fryers, etc., must be properly maintained and kept clean of flammable residues. All employees are to be made aware of the potential fire hazards of their job and the procedures in the written plans. Although having a fire prevention plan is extremely important, don’t stop there! Putting together a comprehensive emergency action plan that deals with all types of issues and potential emergencies specific to your workplace is not difficult, yet having one to guide your employees in a time of emergency, can save lives. The best way to protect yourself, your employees, and your business, is to respond to an emergency before it happens. Written by Eric Fox & Gina Mogavero.